A light salad suitable to welcome in Spring. COMBINE in a large bowl 3 cups cooked rice with half a pineapple, peeled, cored and cut into bite-size pieces. Add 1 can (10 oz.) 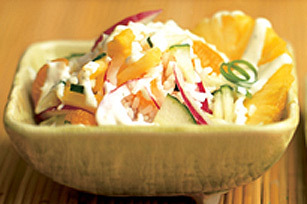 mandarin oranges, drained, half a chopped English cucumber and 1 small sliced red onion. DRIZZLE with 1 cup (250 mL) KRAFT Creamy Cucumber Dressing. Chill before serving.